Max Riedel has just admitted to losing hundreds of thousands of euros before the age of 30, and he is being enthusiastically applauded. The Berlin-born business owner is addressing an unusual audience - young techies gathered on a Thursday night to celebrate catastrophe. 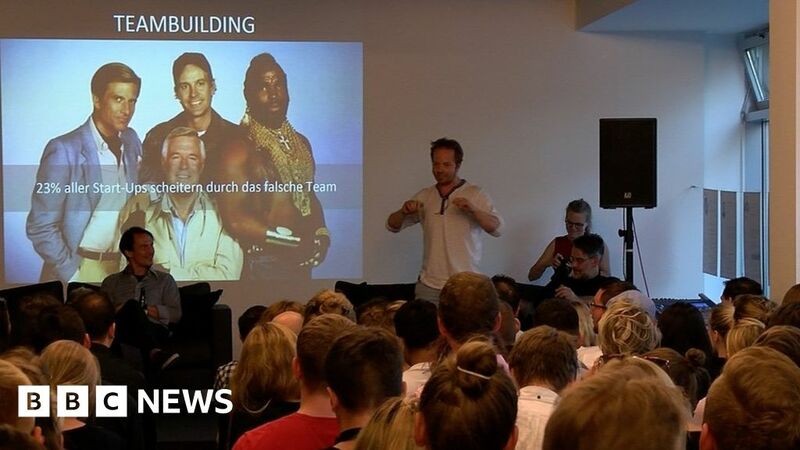 With the help of an amusing slideshow, featuring wisdom from TV`s The A-Team, Max tells the tale of multiple blunders made in the early days of his events company, Holi Concept, which runs festivals and races in cities across Europe. "In the last four or five years, I think I made 20 or 25 hard mistakes," he says, barely suppressing a cheeky grin. "Every mistake cost between 50,000 and 300,000 euros.
" Stories like Max`s are at the core of a worldwide movement - with an unprintable name that loosely correlates with "Failure Nights" - designed to help those involved in young firms and start-ups learn from each others` mistakes. Founded in Mexico, the group has chapters in over 250 cities across 80 different countries, including China, India, the UK, and the US. But in Berlin, the evening is more than just another networking opportunity - it`s an attempt to challenge a deep cultural taboo. "The Germans really have problems talking about their failures," says Patrick Wagner, one of the event`s organisers. A serial entrepreneur himself, Patrick is on a mission to educate his compatriots on the need to embrace risk. "Seventy per cent of all start-ups [in Germany] are going to fail," he explains, "but even in Economic Studies, you don`t get a single lesson about insolvency. "You learn how to make money, but you never learn how to fail.
" Measuring precisely how many German start-ups end up folding is a near-impossible task, in a country that saw almost 2,000 of them launch in 2017 alone. And although some estimate that as many as 90% end up shutting shop, there is no suggestion that nascent German companies fail more often than their Silicon Valley or British counterparts. But according to Philip Strothmann - the driving force behind a host of sustainability-focused start-ups - a fear of failure may be hampering entrepreneurship in the country, with fewer people deciding to start a new business in the first place. There is, he says, widespread contempt in German society for those who play fast and loose with other people`s cash. People usually have "traditional jobs" and are concerned with security first and foremost, he says. If you venture forth and end up with egg on your face, he adds, "they will say, `see I could have told you`.
" It`s not just the neighbours who might disapprove. The process of going insolvent in Germany, says Patrick Wagner, is a "nightmare". He claims the country`s strict laws cause young founders to adopt an extremely cautious approach. "They say Berlin is the new San Francisco," he says, breaking out into a chuckle. "It`s a joke, because no one is risking anything here, and this is a thing we want to change.
" "It can be quite severe for a managing director if he keeps a business running in a state of insolvency," says Christian Spatz, a lawyer at Leonhardt Rattunde, which specialises in restructuring ailing firms. In a book-lined meeting room on Berlin`s Kurfurstendamm, Mr Spatz painstakingly explains how directors in Germany must file for insolvency as soon as they are unable to balance their books, or they may face a criminal conviction. In some cases, directors could even face the prospect of having to reimburse the company, out of their own pockets, for payments made after the firm became illiquid or over-indebted. Most managing directors, he adds, young and old, are not aware of this liability. Even among those who are aware of the legal consequences, Mr Spatz contends, German directors are extremely reluctant to let their company fold. "There`s a psychological aspect, and a social aspect too. Still, in Germany, there is a stigma surrounding insolvency". It`s this stigma that some blame for the perplexing lack of a European tech giant to rival Google or Facebook. But Mr Spatz rejects the notion that Germany`s rules are too stringent, and may be stifling innovation. "I think we have a well rounded system that tries to consider all different players in the field," he says, referring to creditors and employees. `Less risk averse` Berlin, he adds, is a thriving, and growing tech hub, and the endemic fear of failure in German culture is fading with time. "This is changing with my generation, and the younger generation," he explains. "We are a little less risk averse and we`re taking matters into our own hands.
" A few months after baring his soul at "Failure Nights", Max Riedel has very much taken matters into his own hands. His company today runs regular events in more than 30 countries, and the business, now firmly established, is turning a modest profit. Success in his professional life has bred success in his personal life too. Later this year, he`ll finally take some time off from Holi Concept to celebrate his greatest triumph to date - and marry the mother of his 11-month old child.